Track Listing: Triple Water; Square One; Bliss; Bluesishness; Goldies Chance; Miss Lady; Lamb and Bunny; In The Loop; Evergreen; Minimal Moves. 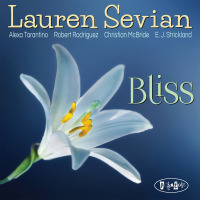 Personnel: Lauren Sevian: baritone saxophone; Alexa Tarantino: alto saxophone; Robert Rodriguez: piano; Christian McBride: bass; E.J. Strickland: drums.